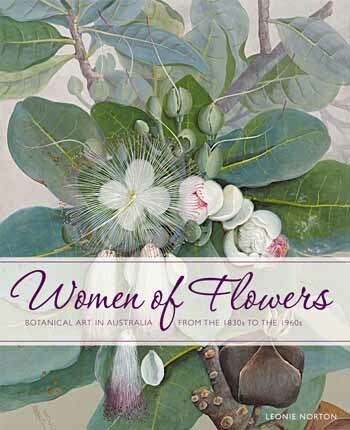 The National Library of Australia has just published Leonie’s beautiful book, Women of Flowers: Botanical Art in Australia from the 1830s to the 1960s. This book pays tribute to a range of brilliant women botanical artists from the nineteenth and twentieth centuries. Ten colonial women artists are featured, with a rare insight into their lives and showcasing their exquisite botanical paintings. Many of the women delighted in painting largely as a diversion from the routine of everyday colonial life while some were more adventurous, travelling great distances to find new and unusual specimens. The works were sourced primarily from the National Library of Australia’s Pictures Collections. It is a social history of these women and their contribution to botanical art, and a celebration of their achievements. No book of this type has been published in Australia and it will be a valuable addition to any library, public or private. With fascinating stories of these interesting women, almost 100 images and fine quality printing and reproduction, Leonie’s book should be treasured as both a reference work and a joy to devour. The book is available at the National Library’s book store. Click here for more information on how to purchase Women of Flowers.